Elrita S. Mielke, 84, formerly of Port Washington, died Tuesday, August 3, 2004 at her residence on Meadowlark Road in Sheboygan Falls. She was born in Port Washington, Wisconsin on May 23, 1920 to Frank and Catherine Swatek Hansen, Sr. She met Alvin Mielke, Sr. of Campbellsport, Wisconsin and they were married March 24, 1942 in Tacoma, Washington. He preceded her in death March 15, 1966. Elrita was a homemaker, but also worked at Krier Preserving in Belgium, Portal Industries in Grafton and made cavier for Smith Bros. Restaurant in Port Washington through the years. She enjoyed crocheting and sewing along with cake decorating and gardening. In 2001 she moved from Port Washington to Sheboygan Falls with her caregivers Tim and Wendy Wells. She is survived by her children Mary Borchardt of High Springs, Florida, Rita (Roy) Werner, Sr. of Plymouth, Alvin Mielke of Saukville, David (Kathy) Mielke of Silver Creek and June (Randy) Mueller of Port Washington. She was the proud grandmother of 19 grandchildren and 19 great grandchildren. Further survived by dear friends and caregivers Wendy & Tim Wells of Sheboygan Falls, sisters Catherine Hansen, Marie (Carl) Dana and Ida (Jerry) Turenne all of Port Washington, other relatives and friends. 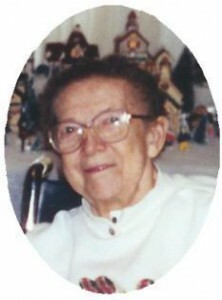 Preceded by her husband, grandson Bradley Wegner, brothers Frank, Jr., Joseph, John, Leo and Lester and her twin sister at birth. Rev. John Klieve will officiate services 10 am Saturday, August 7, 2004 at St. John’s Lutheran Church, 403 N Foster Street, Port Washington. Interment Union Cemetery, Port Washington. Visitation Friday, August 6 from 4 – 8 pm and Saturday 9 – 10 am at the church.